Front Box Ticket For Sector 05, Row "a"
Home>Shopping>Tickets>Sambadrome>Front Box (row "a")>Monday (special Group) - 02-24-2020>Front Box Ticket For Sector 05, Row "a"
Tickets for front boxes at sector 5 row “a”, the sector is close to the beginning of the parades. Buying this product is a guarantee that your ticket will be for a front box at row “a”. This area is composed by four lines of front boxes, rows “a”, “b”, “c” and “d” - a” is the closest one and “d” is the farthest one from the avenue. Each front box contains a private area for only six tickets, one for each of its six numbered seats. A front box ticket is perfect to guarantee more privacy, comfort and perfect photos. At this specific position on the sambadrome it is possible to see the parade with more quality than in the first sectors due to its proximity to the middle of the avenue. Sector 5 is located between two judge’s area so you can wait for good performances nearby. This ticket is valid for the parades of the samba schools from the special group on Monday (02-24-2020). ATTENTION: the value of the ticket added to the value of the TRANSFERS INCLUDE convenient taxes to reservation of the tickets. 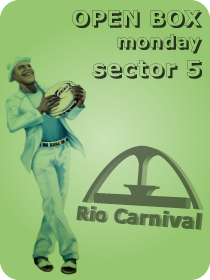 Regular shuttle service for sectors 3, 5, 7, 9 or 11 to the Sambadrome with three or four available pick up locations on the seaport or the greatest hotels of Rio de Janeiro (check the hotels list). The transfer back to the hotel can only be made at the ending of each Samba School presentations.